It’s off to the races. Talk about fast, the new MacBook Pro’s are coming in at blazing speeds. To put this is an understatement for sure. The new top of the line MacBook Pro 2011 is faster than the existing Mac Pro desktop. Basically, the ‘low-end’ base MacBook Pro 2011 13” is just as fast as last years top-end MacBook Pro models. The MacBook Pro 13” with Intel Core i5-2415M 2.3 GHz (2cores), which is the “slowest 2011 MacBook Pro’ is almost as fast as the last years fastest MacBook Pro. Osxdaily.com put together some benchmark speed tests and it shows that the new MacBook Pros’ are extremely fast. Some of the new Mac Book Pros’ are almost 3x’s faster then last years models. That is an incredible feat by Apple. Some companies make their computers maybe just double their speed. Sometimes companies just focus on the looks of the computer. Not Apple though, they focus on what really matters. A computer is good until it starts to become slow. Apple’s new MacBook Pros’ are faster then many computers out on the market. There are only so many things you can actually do to a computer until you can’t do anymore. Apple hasn’t changed the design, granted that it looks extremely good so it is probably unnecessary to change the outerwear, but they have definitely changed the inside. Isn’t that what matters though? The outside appearance is only good until you figure out what’s on the inside. Last year’s version of the MacBook Pro 13” with 8GB RAM and a 2.4GHz Core 2 duo got a score of 3128. 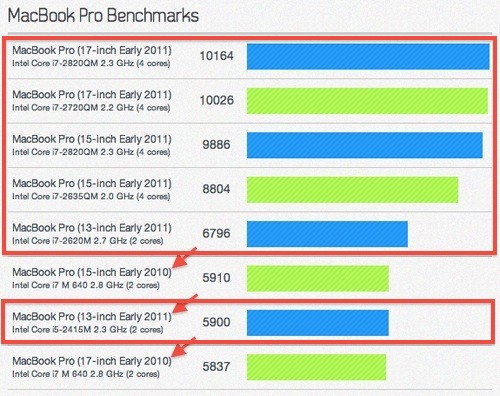 The new MacBook Pro 13” in 2011 with Intel Core i7-2620M 2.7 GHz (2 cores) got a benchmark score of 6796. That’s double the speed in one year. From what I can tell, that’s a pretty decent score in just a matter of time. The fastest MacBook Pro is the 17” model with Intel Core i7-2820QM 2.3 GHz (4 cores) with a score of 10164. That is extremely fast and it triples the speed from the previous MacBook Pro. I’m still rather curious about the MacBook Pro and if it is actually faster then a Mac Pro desktop. Osxdaily.com says that the MacBook Pro’s are, but until I see some tests, I don’t really believe that. The Mac Pro’s are extremely fast and I definitely say that as an understatement. No other desktop can even compete with the type of speeds that the Mac Pro pushes out. Put all the crazy fast technology, all the talk about Intels SandyBridge chips being blazing fast, and it is all true. If you didn’t buy a MacBook Pro last year, or you just want to upgrade, I would definitely buy the new MacBook Pros’. Tell us what you think about these new MacBook Pro models.